Toshiba's latest entry into the budget tablet market is a bewildering mix of awesome and disappointing. With a $99 price tag, the tablet lets us know in advance that we should have low expectations, and for the most part it meets those expectations. With one exception, this is an unremarkable budget tablet that would be lost in the mass of similarly priced tablets. The screen, storage, camera, and ports are unremarkable. But unlike its competitors, the Excite Go is based on an Intel Bay Trail CPU, making it far more powerful than any other new tablet with a similar price point (this does not include refurbs and closeout deals, of course). The Excite Go sports a 7" display with a screen resolution of 1024 x 600, or what was common on last year's budget tablets. It runs Android 4.4 on an exceedingly powerful 1.3GHz quad core Intel BayTrail chip with 871MB RAM, 4GB of accessible storage, a weak camera, and a minimum of ports and card slots. With a single camera in the upper left corner of the tablet's face, this tablet is intended to beheld in portrait mode. It comes equipped with a single speaker on the bottom edge, and on the upper edge you will find the microUSB port, headphone jack, volume buttons, and microSD card slot. The power button is located on the upper right edge, near the camera. This is a cheap tablet, and it looks and feels cheap. When I first opened the box I thought that I was looking at a knockoff no-name tablet from China, and not a tablet from a major name brand. I'm used to cheap tablets, and even tablets in this price range don't usually give the impression of being made from a cheap plastic. I've had it for two weeks now and I still get the feeling that Toshiba farmed the design out to one of the tablet OEMs in Shenzhen, China (this could come in handy as a theft deterrent). But aside from its appearance, it's not actually a bad tablet. It has a couple points in its favor (performance, mainly), and while it doesn't excel in any other category it still passes muster. I ran my usual tests and got an estimated battery life of 4 hours of video watching, with the backlight and Wifi on. Toshiba listed the Excite Go as having 7 hours of battery life, but I don't think that's realistic. Four hours battery life is adequate but it is still below par. Other tablets, including the recently launched Sero 8 from Hisense, have an estimated battery life of 5 or 6 hours. This is a $99 tablet and you can see that in the screen. The Excite Go has a 7" display with a resolution of 1024 x 600, one step up from nothing. It's a cheap quality screen with, well, complicated viewing angles. It's not a great screen, but it's also not the worst I've seen on a budget Android tablet. The ideal viewing angle is fairly narrow, but there isn't a huge difference in image and color quality when viewing the screen head on versus from an extreme angle. In other words it is possible for a bunch of people to crowd around this tablet and share it (briefly). They'll be able to glean most of the detail on the screen - but not necessarily all. To put it simply, this is a B- grade screen, as compared to the C, D, and F grade screens on the market. And if I were not considering the screen in light of the powerful CPU, I would actually be saying nice things about it. There is a single-front-facing camera. It has a VGA resolution, and the less said about it the better. Rude comments aside, I can't actually get a good quality photo from it; the images are grainy and poor quality (even at VGA resolution). I suppose this might be good for video chatting but when it comes to photography it might as well not exist. The Excite Go runs a stock version of Android 4.4 with a minimum of bloatware. It ships with a few utility apps from Toshiba as well as the usual stock Android apps and Google apps, and there's also an Ebay app and OfficeSuite Pro. The last app is actually the full version of the app, which usually sells for $15. With that kind of a value I would not call it bloatware. Over the two weeks I have had this tablet I have installed my usual apps, including benchmark apps like Antutu, reading apps, and a couple alternate web browsers. I haven't had any issues. The Excite Go ships with just Youtube and the basic stock media player found on all Android devices, and thanks to the CPU it is more than enough to play a video. Video performance is great, but the sound quality isn't so great. The Excite Go has a single speaker which is both quiet and cheap sounding. On the plus side this tablet does have Bluetooth, and it has a headphone jack, so the sound issues aren't really that important. This the one category where the Excite Go excels. Much to my surprise, this tablet scored better on benchmark tests than tablets which cost twice as much. To put those scores into perspective: they are all higher than the reported scores for last year's Nexus 7 (more details here). 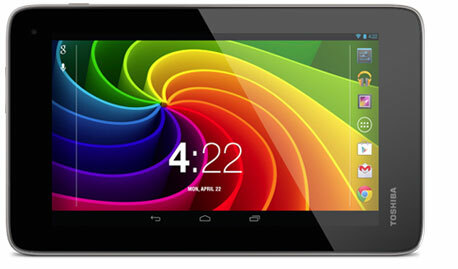 That makes the Excite Go one incredibly powerful $99 Android tablet. It is so powerful, in fact that in order to find a tablet with higher scores you'd need to look at the latest flagship tablets like the Shield tablet from Nvidia. What's more, I can't verify the scores with a hands on test. I don't do anything on Android which would actually be able to push this tablet to its limits. As a $99 tablet, the Excite Go has little to recommend it. This tablet has a screen, storage, AV abilities, cameras, and build quality that is typical for $79 to $99 tablets, and it has battery life which doesn't compare well to similarly priced tablet released last year. But in spite of its general meh-ness, the Excite Go does have one thing going for it: performance. This tablet is built around a powerful BayTrail CPU from Intel, giving it a performance that is two to three times as powerful as similarly priced tablets. I think the performance is a great reason to buy this tablet, and if not for the other shortcomings I would be shouting its praises. But unfortunately this very fast tablet doesn't have a lot of storage to work with, and it can't run fast for as long as I would like. To be fair, a lot of other $99 have the same amount of storage and many have similar battery life. But those tablets also don't have powerful CPUs which are being hobbled by otherwise marginal specs. Call me nitpicky, but I feel that if Toshiba had spent a few extra bucks to get a better battery and more storage then this would be an awesome tablet, and not just a decent one. I’ve read quite a few of your tablet reviews and you always mention the Camera do you or anyone elase actually use a tablet for photography? I’ve seen people using Ipads to take pictures and videos and I just want to smack them. If the camera is good enough, yes. I used the camera on my Galaxy Tab for show floor blogging. I would have used my Sero 7 Pro for the same purpose, but it broke before I had a need. Oh glad I am not the only one to ask. Thank you for the reply. I take it you prefer a tablet to a smartphone for the same reason then? I did back then but we now have 7″ and 6″ phablets. The only reason i would prefer a tablet over a phablet is cost; I wouldn’t use the cell connection and wouldn’t want to pay for the chips. What good is the camera if it is only front how do you focus it?